Description : Opium (Latex) is antispasmodic, antitussive, astringent, expectorant, hypnotic, narcotic, myotic and stimulant. It stimulates the generative organs. Useful in seminal debility, diarrhoea, dysentery, insomnia, sciatica, colic, severe cough and asthma. Also recommended as an aphrodisiac as it is believed to lengthen the time of seminal discharge during coitus. Also used in combination with other drugs in the treatment of diabetes mellitus. Recommended Dosage : 30 to 125 mg dried latex. 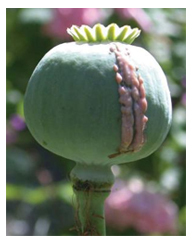 Contraindication : Avoid long term use of opium. Opium is not recommended during pregnancy or lactation.